My armor is contempt. My shield is disgust. My sword is hatred. In the Emperor's name, let none survive. Song of my soul, my voice is dead; Die thou, unsung, as tears unshed. Shall dry and die in Lost Carcosa. Condition: box has a small dent in one corner. Contents like new. All cards sleeved. 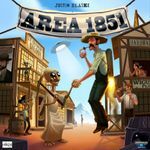 Includes Area 1851: Promo Cards from kickstarter / essen.